This dapper dude is ready for a Halloween night on the town! 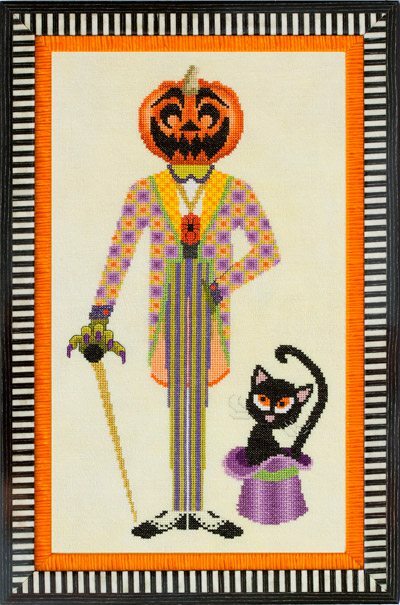 Lots of bright Halloween colors, just the right amount of metallic braid, and a subtle crystal shine in the fabric. Definitely a fun stitch! Fabric: Stitched on 28ct “Crystal Chime ” Cashel Linen by Picture This Plus. Design Area: 7-3/84w X 14-3/4″h. Fibers: Uses a total of 29 colors of Sullivans floss and 4 colors of Kreinik #4 Very Fine Braid. DMC and Anchor comparable colors are also provided.